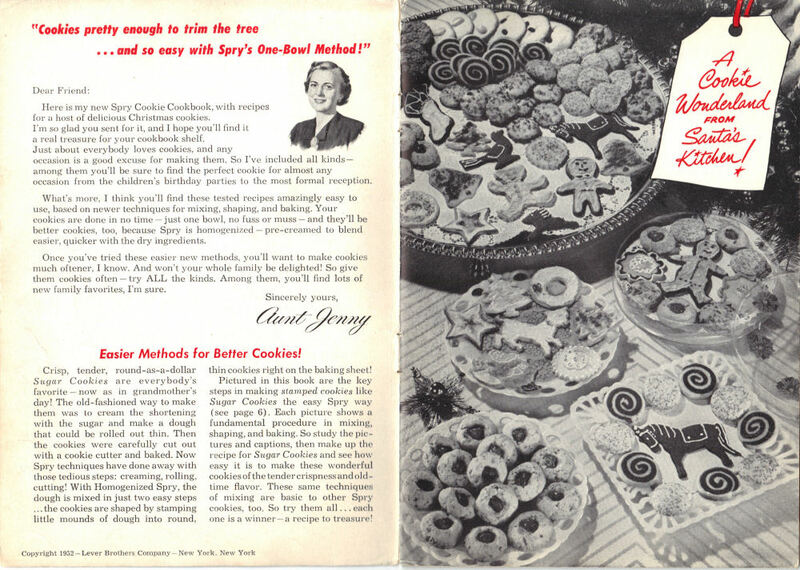 Here is the inside cover and page 1 of the vintage Spry cookbook “Aunt Jenny’s Old-Fashioned Christmas Cookies”. This was published in 1952 and distributed by Lever Brothers Company (the maker of Spry shortening) and featured the company’s advertising character “Aunt Jenny”. You can view all the pages in this cookbook by visiting this category: Aunt Jenny’s Old-Fashioned Christmas Cookies, simply click a page title to view that section. There is a scan of the pages included below that is clickable to view a larger size. Here is my new Spry Cookie Cookbook, with recipes for a host of delicious Christmas cookies. I’m so glad you sent for it, and I hope you’ll find it a real treasure for your cookbook shelf. Just about everybody loves cookies, and any occasion is a good excuse for making them. So I’ve included all kinds–among them you’ll be sure to find the perfect cookie for almost any occasion from the children’s birthday parties to the most formal reception. What’s more, I think you’ll find these tested recipes amazingly easy to use, based on newer techniques for mixing, shaping, and baking. Your cookies are done in no time–just one bowl, no fuss or muss–and they’ll be better cookies, too, because Spry is homogenized–pre-creamed to blend easier, quicker with the dry ingredients. Once you’ve tried these easier new methods, you’ll want to make cookies much oftener, I know. And won’t your whole family be delighted! So give them cookies often–try ALL the kinds. Among them, you’ll find lots of new family favorites, I’m sure. Easier Methods for Better Cookies! Crisp, tender, round-as-a-dollar Sugar Cookies are everybody’s favorite–now as in grandmother’s day! The old-fashioned way to make them was to cream the shortening with the sugar and make a dough that could be rolled out thin. Then the cookies were carefully cut out with a cookie cutter and baked. Now Spry techniques have done away with those tedious steps: creaming, rolling, cutting! With Homogenized Spry, the dough is mixed in just two easy steps…the cookies are shaped by stamping little mounds of dough into round, thin cookies right on the baking sheet! Pictured in this book are the key steps in making stamped cookies like Sugar Cookies the easy Spry way (see page 6). Each picture shows a fundamental procedure in mixing, shaping, and baking. So study the pictures and captions, then make up the recipe for Sugar Cookies and see how easy it is to make these wonderful cookies of the tender crispness and old-time flavor. These same techniques of mixing are basic to other Spry cookies, too. So try them all…each one is a winner–a recipe to treasure!